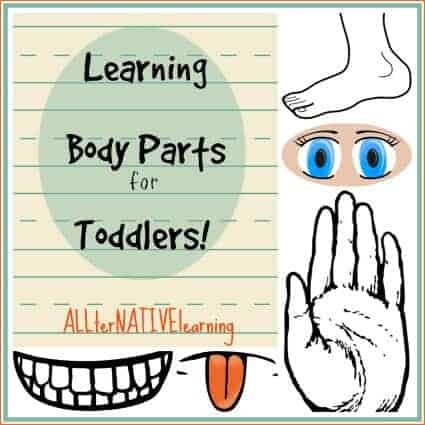 Learning body parts is a part of every day life with babies, toddlers, and preschoolers. They are fascinated with who they are and the bodies they have. Creating an awareness of their bodies is also an important part of development. For us, we started exploring different parts of the face from about 8 months old because we would talk about our eyes and nose during our breastfeeding time. Now at 17 months we have really started working on more than just facial features. This week was a blast because not only could she show me that she was learning, playing, and having fun doing so, but she could even show strangers in the store what she was learning. She is such a ham and loves to entertain people, so she loved telling everyone where their eyes, noses, and knees were! 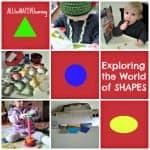 Plus, this week was a fun week to explore movement since our bodies were made to move. You can bet that our house was rocking and rolling all week long! Thanks for using our tot school guides. 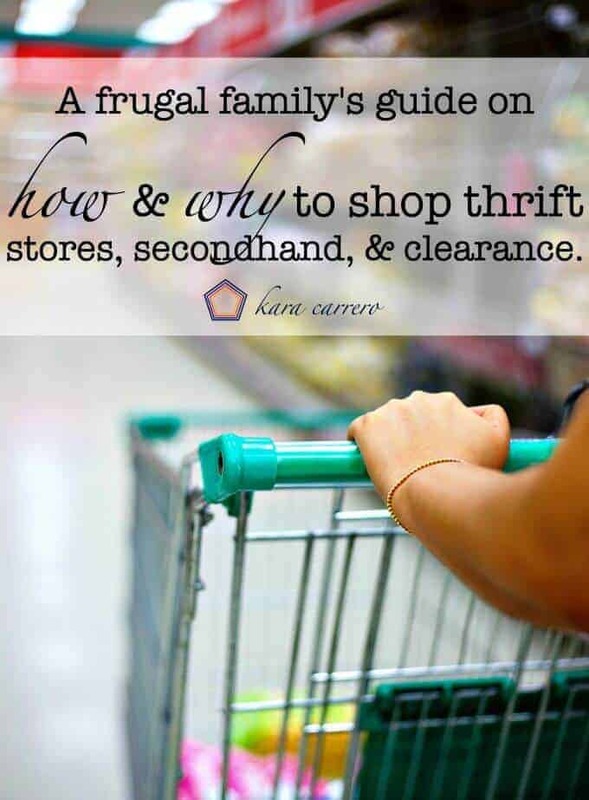 This post contains links to products I recommend and/or our family uses regularly and we may receive a commission. Our all time favorite toy from this week has been Thinkfun Roll and Play Board Game from Discovery Toys. I actually found this at a thrift shop, but would buy it over and over again because it’s just so wonderful. Not only does it encourage motor skill development, but it can break up a mundane day. It shows different body parts and what we can do with them or what they do in general. I love and recommend this toy so much! Buy or make your own facial features game. We made our own from cardboard pizza boxes; you can find that project here. It’s a basic puzzle like a Mr Potato head that encourages children to explore where each feature belongs on the face. This would also be a great busy bag idea, just scale it down to a travel size like this one from Craftulate. Or use Face stickers like the make-a-face ones from Melissa and Doug. We have two great puzzles that she loved too. On was on the Hands and the other on the Feet . I also like to have toys that can be used in multiple ways so these will also be great for counting. Books – find EVEN more of our favorite body and bodily functions books by clicking here! It’s hard to find a children’s book that doesn’t at least mention some part of the body. And really every book tends to have an animal or human that can be used as an example to point out eyes, nose, mouth, etc..
My absolute favorite book for learning body parts with toddlers is called From Head to Toe by Eric Carle. Not only do I adore him as an artist and author, but this books is just that great. I love it because it literally goes through body parts from head to toe and it encourages movement in children. We read this book SO MANY times this week because it was a great break from other aspects of our day and to burn some energy. 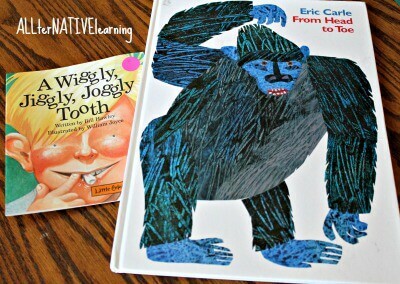 We also liked A Wiggly, Jiggly, Joggly Tooth because it was a fun book and a loose tooth. My daughter loves her teeth and there were so many fun words that this book was also a hit. Thumbprint Critters is also a fun books because it’s a fun way to dive into some toddler led art, plus I love books that have extension activities whether physical or artistic. Every kid loves their belly button so two great books we have loved on this topic were the Belly Button Book by Sandra Boynton and Where Is Baby’s Belly Button? which actually has more to do with the whole body and no just the belly button. Bible verse of the week – Romans 10:15 “And how can anyone preach unless they are sent? As it is written: “How beautiful are the feet of those who bring good news!” I absolutely love this verse and feel like it’s so important to teach our children. There were just so many verses that I could have included but this one is just an important concept and so powerful! Sing Head Shoulders Knees and Toes! Do some hand and foot art with your toddler. Check out some great ideas from Pinterest on boards from Mama Miss and Artsy Mom has one for animals and one for just the holidays. Make some flashcards for the body parts you want to learn by the end of the week. These can be matched with a larger picture of a full body. We did head, hair, ears, eyes, nose, mouth, teeth, tongue, neck, chest, belly button, leg, knee, foot, and toes. Practice gross motor skills like hopping on one foot. Play the hokey pokey with each of the body parts you’re trying to learn this week. Download the facial features printables to sing all about the face and what it does. Be sure to explore other ideas we have completed and download the calendar & planner to get started! Great ideas! 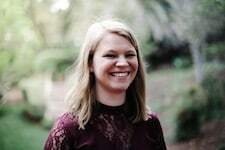 Thanks for including a link to us! No problem! I loved your printable and just had to include it! awesome idea, I teach three year olds and this day and age parents are children having children so ours do not know anything about their body, loved your simple idea to teach hard to reach clueless willing to learn children. 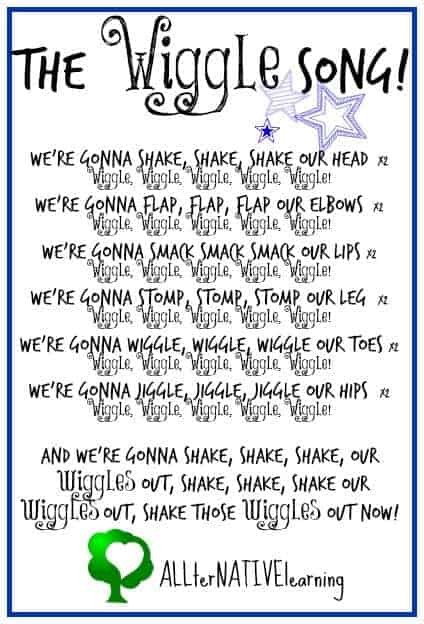 love the wiggle song but just wondering what tune you sing it to?